Benji stood unhappily at the bus stop, trying to imagine all the things that were worse than the first day back at school after the holidays. So far he had thought of magpies pooping in his undies when they were hanging on the line. Or his older sister using him for make-up practice while he was asleep. Or possibly a zombie invasion. He was still thinking about zombies when he saw a strange-looking double-decker bus coming slowly up the street towards him. It was black and old and looked a bit bent out of shape. He heard its engine moaning and growning as it came up the hill. It wasn’t even a particularly big hill. Then, to his surprise, it stopped right in front of him, and the door slowly hissed open. Benji is waiting for the school bus and isn’t sure he’s ready to go back to school for another year, although if pushed, he can think of worse fates. When an unfamiliar bus collects him and he’s offered an opportunity to make a choice, he decides that he’d like to be a pirate. A buccaneer. It seems that Benji is in charge of this adventure so he has to define just what a pirate is, and what a pirate does. He and his motley crew spend the day in an adventure that is defined by his knowledge – and lack of knowledge – about pirates and their activities. A final encounter makes him question his wish to be a pirate and offers him an alternative view of school. Full colour illustrations appear on each opening, with chapter numbers also telling their own story. 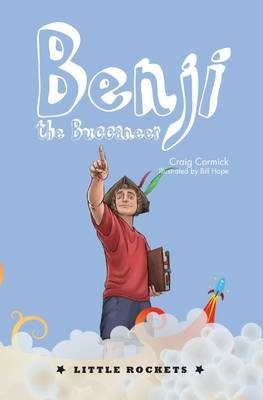 Benji the Buccaneer is a new story from the Little Rockets series from New Frontier Publishing. Each chapter book offers widely spaced text and illustrations on each page to help make the transition from fully illustrated texts less daunting. Benji is offered an alternative to school and happily, if slightly confusedly, takes it. As the adventure unfolds it becomes clear that his education has some gaps and perhaps there is a point to it after all. Benji is in charge of his adventure, despite it being peopled by an odd assortment of other characters. And it is Benji who finally decides his final destination at the completion of this adventure. Recommended for lower- to mid-primary readers.